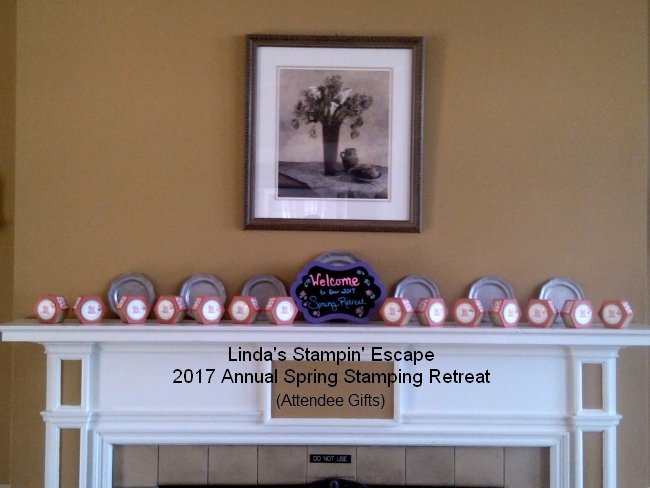 I thought you might enjoy a closer look at our annual stampin’ retreats. Each year I host 2 retreats, one in the spring and one in the fall. 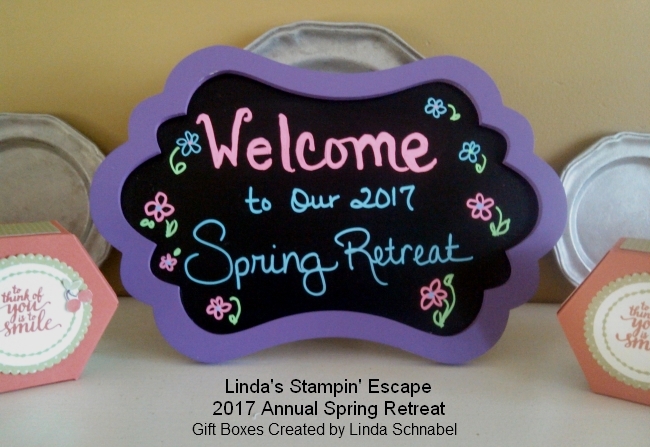 Our retreats were created with our stampin’ friends in mind … A true retreat, a fun and relaxing get-a-way! The lodging, food for the entire stay, and all the projects are included in your price. The cards/ projects are all cut and ready for you … except for a few minor exceptions where we are teaching a new fold or technique. So sit back and join me as I take you through some of our retreat. All this week I will be sharing pics of the retreat and some of the awesome swap cards that our guests made!! Each of the boxes were hand made by me and the help of my granddaughter Katara. We used the Window Box Thinlits Dies along with the Tasty Treats Designer Series paper. 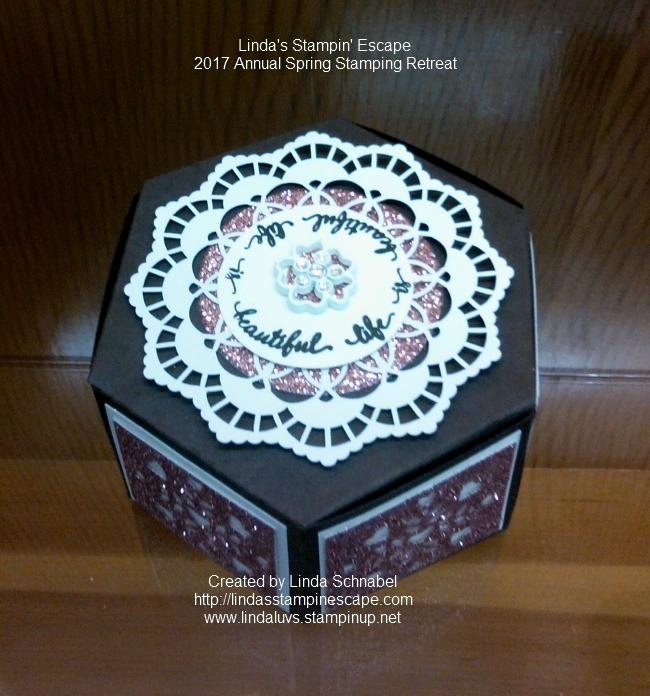 These cute little boxes decorate the dining room until it is time to go home … then each guest gets to take one home! Our cards and project were centered around the Window Shopping Bundle which features the Window Box Thinlits dies we used for the mantle gifts. This session showed them different ways to use the die pieces to create cards! We used the “Blushing Bride” glimmer paper along with the doilies (sold out) and the Falling in Love embellishments. Hope you enjoyed our Friday evening as much as we did. It is a pleasure to stamp with such a wonderful group of ladies. I hope yours is a good one! 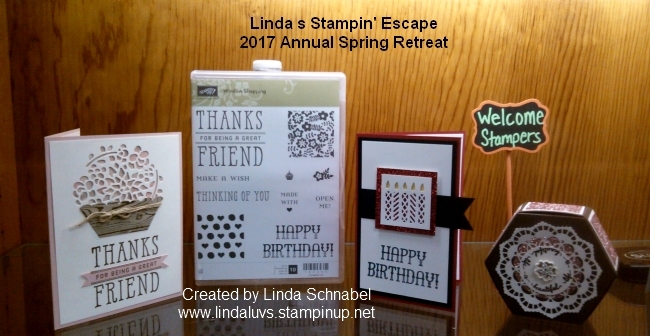 « Off to our Stampin’ Retreat!